Coca-Cola and Pepsi are both colas, but they have different recipes and ingredients. Nevertheless, many consumers can't tell the two sodas apart. Let's start with the basic differences: Pepsi contains citric acid and has slightly more caffeine than Coca-Cola. A 12-ounce can of Pepsi has 150 calories, while a 12-ounce can of Coke has 140. A can of Pepsi contains 41 grams of sugar, while Coca-Cola has 39 grams. With that said, the drinks share more similarities than differences. Both contain caffeine, high fructose corn syrup, phosphoric acid, and "natural flavor." So-which tastes better? That's a subjective question, of course, but both soda manufacturers have attempted to claim victory in their (occasionally vicious) advertising efforts. Coca-Cola consistently outsells Pepsi worldwide, but PepsiCo maintains that its product has a superior formula. Since 1975, Pepsi has concentrated many of its marketing efforts on "The Pepsi Challenge," a blind taste test performed at malls, sporting events, and in other public places; passersby wear blindfolds and try samples of Pepsi and Coke, then pick a winner. In those tests, Pepsi tends to win. However, journalist Malcolm Gladwell attributes Pepsi's dominance in blind taste tests to its punchier taste. "Pepsi is sweeter than Coke, so right away it had a big advantage in a sip test," Gladwell wrote in his bestselling book Blink. "Pepsi is also characterized by a citrusy flavor burst, unlike the more raisiny-vanilla taste of Coke. But that burst tends to dissipate over the course of an entire can, and that is another reason Coke suffered by comparison. Pepsi, in short, is a drink built to shine in a sip test." Gladwell notes that sweeter beverages make a better first impression, but many people might prefer to drink a full bottle of a less-sweet soda. In other words, a simple sip test might not be the best way to compare the beverages. Nevertheless, these days, most people have strong preferences for one of the two major cola brands-and the companies' marketing tactics are largely to blame. Since the 1980s, PepsiCo and the Coca-Cola Company have taken very different approaches. Coca-Cola has positioned its brand as wholesome and family friendly, while Pepsi advertises their company as hip and irreverent. Occasionally, the brands have referenced one another; when Pepsi advertised during Super Bowl LIII in Atlanta-where Coca-Cola has its head office-they used slogans like, "Pepsi in Atlanta. How refreshing," and "Hey Atlanta, thanks for hosting. We'll bring the drinks." The Coca-Cola Company often avoids addressing Pepsi directly, but in 1985, the company announced a reformulation (commonly referred to as "New Coke"), which was widely seen as a response to Pepsi's superior performance in blind taste tests. The slightly sweeter drink was disastrous for the brand, and Coca-Cola's original formula reappeared on shelves within a few months. Even so, the Coca-Cola Company might be getting the last laugh: According to trade publication Beverage Digest, Coke's market share has risen from 17.3 percent to 17.8 percent over the past decade, while Pepsi's has dropped from 10.3 percent to 8.4 percent. Alot is different coke is nice pepsi is evil and pepsi is a trick you think oh it will taste sweet and bitter like coke but no it turns so sweet and evil never trust pepsi no matter what it will always explode unlike pepsi, coke is super truthful and never explodes!!!!!!! Thank you if you work for coke or pepsi sorry but this is the flat out truth!!!! How are coke and Pepsi different? What are differences and similarities Coke and Pepsi? Well their both soft drinks so theres 1 similarity. they both are "dark" sodas. pepsi has phosphyrus. coke dosen't. Does Coke taste different from Pepsi? Yes most definately AnswerTo some people they can taste a difference.Yes. Coke has a tart taste to it, Pepsi has a stronger sweetness. What is coke and Pepsi? Coke and Pepsi are brand names of two well known colas. Why does coke taste different from pepsi if they are both coke? Because Coca Cola (Coke) and Pepsi Cola, two different companies, use different ingredients to create their soft drinks. Coke and Pepsi are not both coke, but they are both colas because they both include kola nut flavoring in their ingredients. Pepsi tends to taste sweeter that Coke when compared side by side. Ingredients for pepsi and coke? Who made Pepsi and coke? Go on Ask.com they have way BETTER answers :) ! How are coke and pepsi the same? What is the difference between coca cola and pepsi? The main difference is just brand name cola, but the taste is slightly different. Is Pepsi healthier then coke? I'd say they're about the same. Is coke or Pepsi better? Pepsi and Coke are rival soda companies and people are always asking which is better. Really, nit is your own opinion which one is better. Some think Coke is better. Some say Pepsi is better. Some say Pepsi is sweeter. Some say Coke is sweeter. Truthfully, Coca Cola has less caffeine than Pepsi. But, it won't be me to tell you that Coca Cola has less caffeine so you shouldn't drink Pepsi. Is Pepsi healthier than Coke? As far as I know,neither is healthier than the other, but I think that Pepsi may be a little healthier because Coke tastes sweeter. I think that if I had to choose Coke or Pepsi, I would choose Coke because it is sweeter. I hope this helped. Is Pepsi better than Coke? I tried both coke and pepsi. Both sodas taste differently depending on the users. In my opinion, Coke is definitely better than pepsi and here's why,It is mainly because of their formula that will cure depression and make people very happy. I drank it and it is a good way to get rid of my sorrows away. The best way to drink Coke is from the glass bottle or from the glass cup with ice. Yes! Definitely. (See chapter 5 of Malcolm Gladwell's Blink. Section 2, about the Pepsi Challenge). Is Pepsi a coke product? No. Pepsi is made by Pepsico. Coke is made by Coca Cola. Is coke cheaper than Pepsi? Did pepsi buy out coke? No. The Coca-Cola Company is about $157 billion in market capitalization; Pepsico is about $100 billion. It would be difficult for either one to buy out the other. Also, it is unlikely that the US Justice Department would approve of such a merger, on antitrust grounds. Is Pepsi older then coke? Is Pepsi waterier than coke? Who owns Coke and who owns Pepsi? What shoots higher coke or Pepsi? Are pepsi and coke owned by the same company? No, two different companies, producing a similar product in direct competition for sales. What are the stats for Pepsi vs coke? Does Coke and Pepsi contain red dye 3? Does coke and Pepsi have their own patents? Yes, they both have two separate patents. Pepsi or coke which is healtheir? Is Pepsi a copy of coke? No-one really knows. Here's the order. First: Dr-Pepper (December 1, 1885) Second: Coca-Cola (1886) Third: Pepsi (Ten years later after Coke) I have tried both coke and pepsi. Coke is however kind of sweet to me. And pepsi is ok. Really you can't find the difference of coke's and pepsi's tastes. They both actually taste the same. So I wouldn't really say pepsi copied coke. Why is Pepsi better than coke? Does coke or Pepsi affects kidneys? Who sells more Coke or Pepsi? The fact is the answer depends on what you mean by Coke or Pepsi...the company or the drink. If you mean the cola drink, then Coke is. Pepsi has never out-sold Coke in the 108 years of competition between the two. If you mean the company, then Pepsi has somewhat recently passed Coke, selling more water and other drinks (including Pepsi cola) combined. This, according to Fortune. Why is coke better than pepsi? Was Pepsi in India before Coke? Coke vs Pepsi sales line charts? Coke is the best out of all sodas. Can Coke or Pepsi shorten life? If you drink too much then yes. Is Coke or Pepsi for girls? What is drank more Pepsi or coke? What soda freezes faster coke or pepsi? Coke because there is more water in the coke than the Pepsi beacuse of Pepsi having more sugar in it. What has more sugar Coke or Pepsi? Actually, Pepsi has more sugar than Coke, but Coke has more calories compared to Pepsi. What brand is older: pepsi or coke? 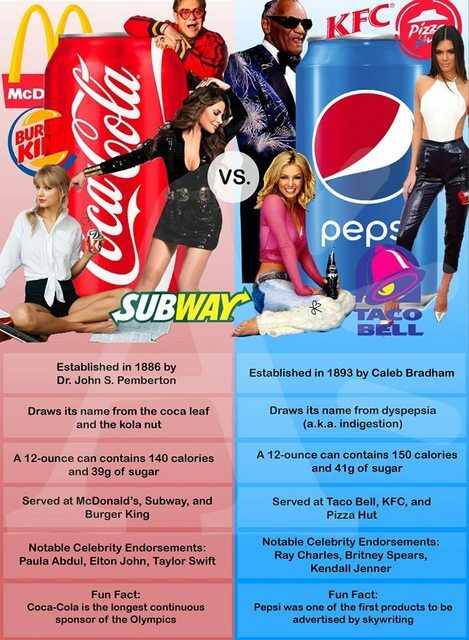 What beverage is healthiest coke or Pepsi? Non of them is healthy , but maybe pepsi . Do coke sprite and pepsi fizz at the same rate? Pepsi is the one that has the most fizz. Does coke have more acid then pepsi? Yeah Coca-Cola is much stronger then Pepsi.